Everyone from Zara to Mango has tapped into the embroidered slogan T-shirts trend recently, but the tees that are getting the most attention this summer are by an Egyptian student selling her designers from a Gmail address. But this isn't your average student side project, as even Vogue has praised Dana Frid's floral tees and sweatshirts. There's something nostalgic about her muted pastels covered in intricate floral embroidery, but this is then contrasted with cheeky designer slogans and references, such as "Pray for Prada" and "Keep the snakes away unless they Gucci." "I listen to a lot of R&B and rap songs," Frid explained to Vogue. "Their lyrics always mention luxury brand names, and that's what initially inspired the slogans." It's certainly a recipe for Instagram success, so it's not surprising that she has already amassed 25k followers. The Cairo student might be running her fashion empire from an email address and Tumblr account while she finishes her business and political science degree, but she plans to move to Paris to expand her designs. If you're hoping to place an order, the magic email address is danaelshafiee@gmail.com. Scroll below to see some of our favourite Dana Frid T-shirts. 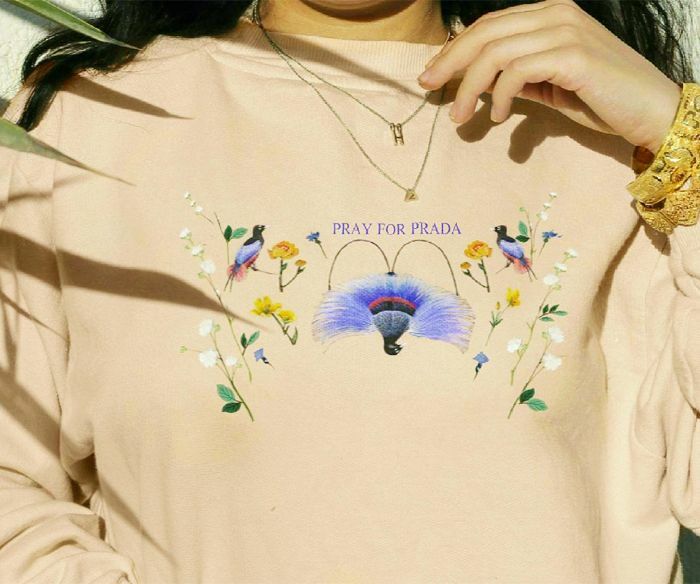 The "Pray for Prada" sweatshirt is a Who What Wear favourite. We love the nod to Gucci with Alessandro Michele's snake motif. A moto to live by. The flowers look straight out of an English country garden. Next up, shop our guide to the best T-shirt brands, because finding the perfect white tee can be tricky.